With my sincerest apologies for the radio silence of late (life keeps getting in the way), I wanted to take a moment to talk a little bit about prologues. In the process of writing a book, the prologue is the last thing you write. How many of you have heard this before? I’d heard it a million times, but in my case it turned out not to be true. At the onset of everything, three paragraphs gave life to my book (guided, unknowingly, by the hand of the immodest Mr. Muse). They were not my best work, but they were pivotal; after all, they had been the catalyst for everything. These three paragraphs became my prologue. As I worked to finish the book, I knew in the back of my mind that I would have to revisit the prologue at some point. That point didn’t come until I was ready to begin submissions. As I am sure most of you know, when making submissions to literary agents you only have a few pages to make an impression. That means your prologue and/or the first few dozen pages of your book need to be good (to say they’re crucial is the understatement of the century). You need to make an impression that sticks. This is how the first words I wrote of this book also turned out to be the last. 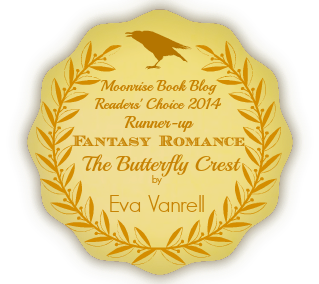 As I’ve mentioned before, the first few chapters of The Butterfly Crest follow Elena’s very ordinary life. The story doesn’t stay ordinary for long, but it just so happened that the submission lengths were never quite long enough to reach the extraordinary parts (in most cases you get 10-15 pages, that’s it!). This meant I somehow needed to find a way to infuse the beginning of the story with some of the magic of the rest of the book. I initially played with the idea of doing away with a prologue entirely (better no prologue than a weak one) but I got over that pretty quick, because it still didn’t solve the issue of making an impact with the first few pages. So I pondered my options for a few days. At some point between frustration and utter hopelessness, it hit me—I had already written the prologue. Halfway through the book, I had written a passage that broke from the narrative of the story. For the first time in the book, Elena’s consciousness was not the point of view. Like a tear in the fabric, the reader is given an insight into what’s going on behind the scenes. The same thing happened three or four times throughout the story, and one of those moments was a perfect fit. With that brief introduction behind us, I’d like to share the final version of the prologue with you. It’s short, but I think pretty effective. What do you think? Comments are welcome. As the fractured light of dawn breached the threshold, two voices spoke in whispers in the fading dark. “Are you going to coddle her the entire time?” hissed the female voice, the quality of her tone brittle and wispy, like the rustle of desiccated leaves. She was the Keres, the goddess of violent death, believed by humans to be three spirits but in truth was only one. Death, her brother, sat across the room from her, holding a mortal woman in his arms. The woman writhed and twisted, struggling with the demons in her sleep. With careful hands, Death brushed the hair out of the woman’s face and then lifted his icy gaze to his sister’s. “Why do you care?” he asked. “Because I do not want you to end up like Dionysus. She’s going to die just like the rest of them,” the Keres said. With a baleful cry, the Keres was gone. **Copyright © Eva Vanrell, 2011 – 2012. All rights reserved. I should have known better than to take it at face value, but I happened to run across it at a particularly vulnerable moment during the week. As a writer, you’ll come across these moments (big or small) when you suddenly find yourself thinking it was all for naught, and every nerve in your body is screaming for you to tear it all down and start over again. I’m not talking about the usual artistic dissatisfaction—that’s normal; I’m talking about a sudden shift in perspective where what you had once considered brilliant now seems insipid and forced. That’s where I was, mentally, when I ran across this quote. To make matters worse, my shift in perspective happened to be brought on by a particular insecurity I have regarding my penchant for imagery. Truth be told, I couldn’t kill an adjective if it were coming at me head on with a machine gun in its hands. I should have looked up the entire quote (because it would have saved me several days of mental torture). Instead, I ruminated on it as I continued my work for the week. Then an innocent comment from a dear friend added fuel to my mental fire. A discussion about action scenes versus epic settings, in my mind, turned into a private viewing of my book’s crucifixion. There are as many different types of readers as there are books in the world, and each one of them has their own preference when it comes to styles of writing; it would be insane to think you can satisfy them all. I happen to be the kind of reader who enjoys getting lost in a book, in its scenery and the world it has to offer. Of course, action is important, but to me it’s more about the feeling I get when I read; the sensation in the back of my neck as the world I’m reading about begins to take shape around me (guided by the author’s carefully chosen words). The more details the writer offers, the more elaborate the world taking shape in my mind can be. The experience, for me, has to be one of immersion. It can be a scene as subtle as a Japanese gardener teaching his craft (Gail Tsukiyama‘s The Samurai’s Garden) or as intense as a child’s first kill in self defense during Rome’s invasion of Britain (Manda Scott‘s Dreaming the Eagle), but either way it has to move me; speak to something deep inside of me so that it becomes ingrained in my mind, like a memory (that isn’t even mine). The same thing is true when I write. I tend to lose myself in the world I’m creating or describing. Whether it’s a real place or one that exists only within the writing, I want the reader to experience it palpably; to feel awe and wonder as they step through the threshold. Of course, in my zealous fervor, I can get carried away; it is one of the things I know, going into it, that I need to keep a rein on. 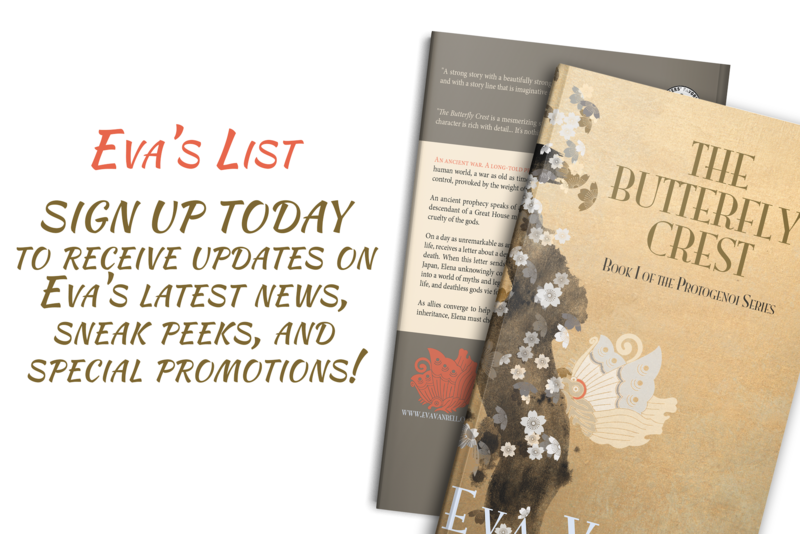 As I wrote The Butterfly Crest, I kept myself in check by doing two things. First, I followed the Coco Chanel rule, “Before you leave the house, look in the mirror and remove one accessory. Less is always more.” Yes, she was talking about fashion, but the sentiment still applies, and, unlike Mark Twain’s rule (or so I thought, throughout the week), this method didn’t require me to kill all adjectives. My second weapon was having my husband edit the book, since he is the farthest thing from my target audience and particularly dislikes overly written books (if I got his seal of approval, then I knew I had something going). Suffice it to say, I tortured myself with this frame of mind all week. I kept going back and forth in my head, dismantling the story and justifying, to myself, the choices I made and the reasoning behind every step of Elena’s journey. I ultimately came to the conclusion I had reached at the beginning of the writing process—I had to strike a balance to maintain the integrity of the story. I couldn’t just arbitrarily kill adjectives. Yes, quite a few met their demise (through the Chanel rule), but others remained and thrived in order to give life to Elena’s journey. Every step chosen was methodically thought out, and randomly sacrificing imagery (adjectives) for more action would only do a disservice to the story I was trying to tell. When you catch an adjective, kill it. No, I don’t mean utterly, but kill most of them–then the rest will be valuable. They weaken when they are close together. They give strength when they are wide apart. If I would have looked up the quote earlier I would have saved myself a lot of grief, but I wouldn’t have had the opportunity to write about this. I think for a lot of us, we are our own worst critics. No matter how much we believe in ourselves, there are moments when we falter (when our genius doesn’t seem so genius-like anymore). It is important to step back in those moments and regain perspective. The instinct that guided you to begin with will return, and then you’ll really regret it if you started killing adjectives arbitrarily while your genius was gone. Every year there comes a day, a singular, spectacular day, when you step out of your front door at the exact moment when summer has transitioned to fall. Sure, the process began long before you took that fortuitous step, but somehow you manage to tap right into the flow of it. It seeps in through your skin to the marrow of your bones, ravaging every nerve ending it encounters along the way. In that pivotal moment, the world stops. A massive silence drowns out every sound as one season shifts into the other, before the world takes a thunderous breath and is born anew; recharged, vibrant, and infinite. A Japanese Maple (Acer palmatum) in the Portland Japanese Garden, photo by Jeremy Reding.